A dog who shows aggression to other dogs, or even people can be very difficult to handle. It’s not surprising then that one of the main reasons for dogs being surrendered to shelters is aggression. Sadly, the prospects for a surrendered dog flagged as aggressive are not bright. Often the shelter will have no option but to euthanize the dog as they wouldn’t be able to risk rehoming. Each shelter will have their own rules and regulations about this so you would need to check these out locally. Puppies aren’t aggressive when they are born. Also, don't confuse mouthing with aggression. Something has happened to make your dog feel that defence against strange people or dogs is the only option, and that aggression is the only option to activate his defence. Try to establish if there was an event that started the aggression, or is this behaviour something that has come on gradually? Confident dogs are rarely aggressive. It is the nervous or timid dogs who are more likely to show aggression. When you feel nervous about your dog’s potential behaviour, your dog will sense this and become more alert, adrenalized and more likely to show aggression. It is important to note that humans hit with their hands and dogs hit with their teeth. In other words, a dog that snaps or bites might be concerned about what you are doing or going to do to them. One of the founding principles of our training is that you should show leadership and be a leader so that your dog can respect and trust your decisions. 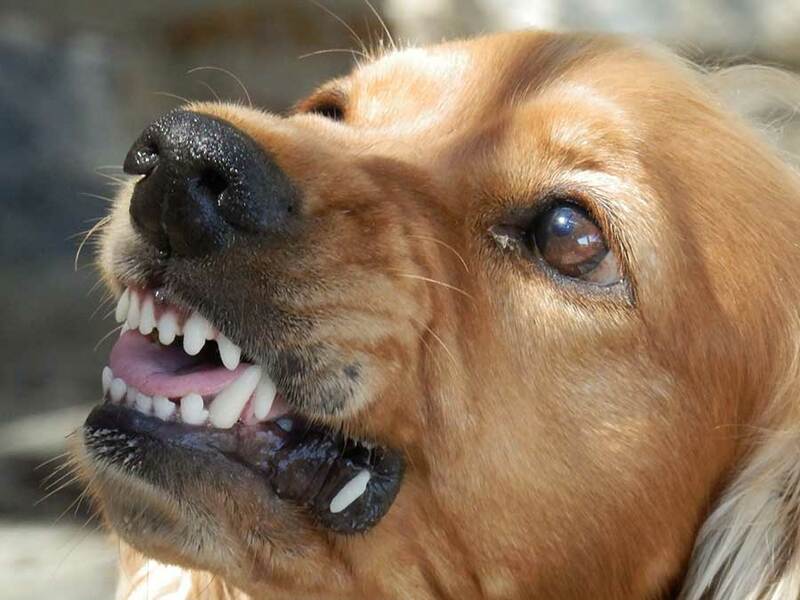 Dogs who show aggression are often nervous dogs who can take on a role as "Head of Security". They feel responsible for the safety, not only of themselves, but of you and the rest of the household. They will often be stressed out by the responsibility they have resting on their shoulders, and so will be permanently on edge, adrenalized and on the alert for trouble. The spike in adrenalin whenever a situation arises, that causes them fear (like a visitor to your home), can result in aggressive behaviour. If your dog spends all day guarding the house by sitting on the back of the sofa, barks at noises outside or everything passing the window, charges at the front door when the postman comes, or when somebody rings the bell, chances are you have a self-appointed "Head of Security" on your hands. He will need to be sacked/demoted/made redundant/redeployed, and you will need to show him that you are in control of the security (and everything else, in fact), and that he can relax in the knowledge that you can look after yourself and him so that he can relax and just be a dog. Look at putting some training into place so that, when your dog feels fearful, instead of going into ‘attack’ mode, he can focus on you and depend on you, knowing that you are capable of keeping you both safe. Use a muzzle, especially when out and about. That way you can relax more in the knowledge that your dog can’t do any serious damage. The more relaxed you are, the more relaxed your dog will be. See our article on muzzle training your dog. Interact with your dog and train him to focus on you whatever the distraction. Start in the home and garden using food and/or toys as distractions whilst keeping his focus onto you. Work on your lead walking. Train your dog to walk beside you or slightly behind you and not out in front. An adrenalized dog should not be out at the front making the decisions. He should be following you, confident in the knowledge that you are making good decisions for both of you. We always say there is no magic wand, especially when it comes to aggression. However, with patience and perseverance, many dogs can be rehabilitated to become acceptable members of society. Some dogs may never be party animals and accept other dogs or people, so don’t force them. Accept that it is better for your dog to focus on you and move past other dogs, or that he would rather sit in his crate when visitors call. Don’t be afraid to call in a professional to help you if you want more help. Your local Bark Busters trainer will be happy to help.